Hello Dolphin Shout, and all Miami Dolphins fans! During the 2012 NFL Draft there were two first round offensive tackle prospects in Matt Kalil and Reilly Reiff, and two second round prospects in Mitchell Schwartz and Cordy Glenn that were chosen before our second round pick of Stanford tackle Jonathan Martin. Three of those four selections prior to Martin are starters for their respective teams. The two starting second round choices were at picks number 37 and 41. 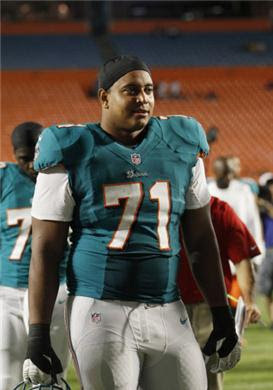 With the 42nd pick of the 2012 NFL Draft the Miami Dolphins select starting tackle Jonathan Martin! What followed the choice of our starting tackle were three more second round tackles at 44, 56, and 60, and only the last of those three is currently a starter in Kelichi Osemele, right tackle for the Ravens. The third round tackle prospect picks, to this point in their career, have amounted to two backup left tackles and one backup left guard. The fourth round brought one starting right tackle to Arizona at number 112 with Bobbie Massie, as well as another backup from selection 131 to the Giants. Furthermore, the fifth round had two more choices of tackle, with the latter of the two at 153 being a starting right tackle for the Eagles in Dennis Kelly. The sixth and seventh rounds had seven tackles that have never been activated for the teams that chose them. An eighth tackle at 221 overall is Nate Potter, who is Cardinals starting left tackle and their second tackle selection of the draft. Here's what I'm trying to say. There were three of four starting tackles chosen prior to Jonathan Martin. After our selection of Martin there were 18 more tackles taken. Of those 18 there are only four starters, five backups, three on the reserved/practice squad, and six that aren't on the roster of the teams that chose them. It might be suggested that, just like the running back position, starting tackle is an easy position to fill at the dime a dozen cost, while the second-tier tackles are all of similar ability to one another. It might also be suggested that an equal value tackle can be found in abundance in the third through seventh rounds. Well, I beg to differ according to the above results. We might have been lucky to have the one forth round guy, the one fifth rounder, or the one seventh round selection fall into the abyss we had at right tackle, while the possibility of those starters for other teams not fitting into our scheme is another thought in itself. There is also the possibility that one of the draft selections that are currently NFL backups, developmental players, or not on someones roster could, should, or would have become our starting right tackle and/or Jake Long's replacement. However, in my humble opinion the Dolphins were way too thin! It would have been questionable to take a risk and wait instead of selecting the sure thing which happened to be right there in front of us. "Jonathan Martin held his own against the NFL's best quarterback hunter. The Miami Dolphins new starting left tackle gave up one sack, about a half dozen quarterback pressures and had a false start, but his performance in Sunday's loss to the 49ers proved he wasn't overmatched against the NFL's best. That's a good sign moving forward. What was also a good sign was seeing Martin push back (ie; headbutt) when Aldon Smith tried to bully him. Martin, the Stanford grad the Dolphins selected in the second-round of the 2012 draft, doesn't exactly fit your typical stereotype of an NFL football player. He's cerebral, and introverted. Those traits got him nicknamed "The Big Weirdo" by his fellow linemen. But when the bullets are flying it has become clear that Martin is willing to mix it up." Was the second round selection of the starting tackle and first round-projected pick of Jonathan Martin the correct choice for the franchise, or should we have gone after some other position of need? THANK-YOU for an Open-Minded read, and we look forward to your angle of view : ) !